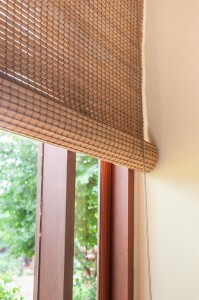 Bamboo shades are a popular window treatment. If you are looking to spruce up your home in a noninvasive and easy way, maybe it is time to consider updating your window treatments. Whether you have had the same ones for years and they are beginning to look drab or you crave a fresh pop of color to make your space truly stand out, keep these window treatment trends in mind. Get ready to transform your living space and turn your windows into showstopping focal points! Some popular window treatment options are natural woven shades in bamboo and matchstick. These soft neutrals provide a balanced and soothing look to any room, by bringing the natural world inside your home in a modern and stylish way. Luxury fabrics are in when it comes to window treatments. Silks, damasks, velvets, leathers, furs, and suedes are a great way to get a little of that highly elegant Versaille look in your home. While minimalism and simplicity are trending, there are still numerous fashionable and tasteful ways to get that old world glamor you love. While shine and sparkle were in for years and years, a return to nature is occurring in window treatment trends and home design as a whole. Soothing natural textures and clean lines are starting to come to prominence. For the environmentally conscious, bamboo is also a sustainable material which is both green and stylish. Minimalism is in and simple, sleek lines can be seen in almost every facet of home decor. Using your window as a sleek and modern focal point with a clean silhouette instantly makes a room look updated and chic. Many people favor monochromatic color schemes panel track systems which can also be utilized as room dividers. Depending on the fabric you choose, these can look contemporary or European. Bright and bold patterns are an excellent way to lend a unique and fun look to any room. If your tastes run more toward the bold, bright, daring, and fun, then why not incorporate it into your home? This is one of the window treatment trends that really makes a statement.